If things go as Richard Branson hopes, today will go down as one of the most important days in human history. This afternoon in New Mexico Branson and the state’s governor Susana Martinez opened Spaceport America. This is the first of Virgin Galactic’s planned spaceports from which they’ll launch actual, commercial flights which will take passenger’s outside Earth’s atmosphere. As reported by Virgin, flying overhead during the dedication ceremony were two of their craft, WhiteKnightTwo and SpaceShipTwo. The first, WhiteKnightTwo will be used to prepare passengers for the rigors of space travel using atmosphere aerobatics. It also functions as sort of a mothership for their spacecraft, SpaceShipTwo. SpaceShipTwo is the actual vehicle meant to take people in to space. When Branson announced commercial space travel as his goal a few years ago, I’m not sure the world took it seriously. It sounded like the wild ideas of a billionaire with too much money and not enough sense. But here we are and, commercial space travel is on the verge of becoming a reality… at least if you’re very rich. 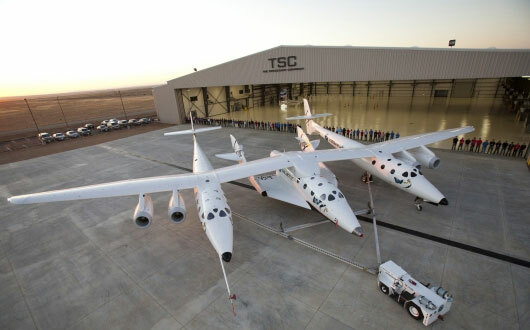 Virgin Galactic expects to begin commercial flights into space some time in 2012. They even have contracts with NASA, to do some of the work America’s national space program can no longer do, now that they’ve shut down their shuttle fleet. Not at all. The prices will go down eventually. Air travel was extremely expensive at first too. Computers used to be so expensive the average person couldn’t afford one. This is just the beginning. as usual, this will only really be available to the “high and mighty” .. aka very rich people ..
Look at it this way Billy, like any new thing these ships most likely have a few, well… bugs to work out. Let them use the rich as guinea pigs, before the company finally makes it affordable to the middle class, lol! Billy Langley This is just the beginning. The price will go down. It’s not that they’re trying to price poor people out, that’s just how much it costs them to operate right now. But air travel was really expensive at first too, and only for the rich. That changed, so will this. This is step 1. I think for now, basically you’re paying for being able to experience real zero G… and that’s worth it. Also they’re talking about taking people up to the international space station. Well, I wonder if I could afford it? even if i were rich i wouldnt pay out couple hundred grand for just 7 – 9 mins in zero G. cos doesnt iss take 90 mins to go all way round the planet, so if it costs $300,000 for 9 mins. wonder how much 90 mins will cos u, i havent got that many kidneys to sell u know!! how well, its a start i guess like 1900’s airplanes. 🙂 at least it in my lifetime!